The Andronovo culture is a collection of similar local Bronze Age cultures that flourished c. 2000–900 BC in western Siberia and the central Eurasian Steppe. Some researchers have preferred to term it an archaeological complex or archaeological horizon. The older Sintashta culture (2100–1800 BC), formerly included within the Andronovo culture, is now considered separately, but regarded as its predecessor, and accepted as part of the wider Andronovo horizon. Archaeological cultures associated with Indo-Iranian migrations (after EIEC): The Andronovo, BMAC and Yaz cultures have often been associated with Indo-Iranian migrations. The Gandhara grave (or Swat), Cemetery H, Copper Hoard and Painted Grey Ware cultures are candidates for the Indo-Aryan migration into South Asia. According to genetic study conducted by Allentoft et al. (2015), the Andronovo culture and the preceding Sintashta culture are partially derived from the Corded Ware culture, given the higher proportion of ancestry matching the earlier farmers of Europe, similar to the admixture found in the genomes of the Corded Ware population. The name derives from the village of Andronovo [ru], Krasnoyarsk Krai (55°53′N 55°42′E﻿ / ﻿55.883°N 55.700°E﻿ / 55.883; 55.700), where the Russian archaeologist Arkadi Tugarinov [ru] discovered its first remains in 1914. Several graves were discovered, with skeletons in crouched positions, buried with richly decorated pottery. The Andronovo culture was first identified by the Russian archaeologist Sergei Teploukhov in the 1920s. Some authors have challenged the chronology and model of eastward spread due to increasing evidence for the earlier presence of these cultural features in parts of east Central Asia. The geographical extent of the culture is vast and difficult to delineate exactly. On its western fringes, it overlaps with the approximately contemporaneous, but distinct, Srubna culture in the Volga-Ural interfluvial. To the east, it reaches into the Minusinsk depression, with some sites as far west as the southern Ural Mountains, overlapping with the area of the earlier Afanasevo culture. Additional sites are scattered as far south as the Koppet Dag (Turkmenistan), the Pamir (Tajikistan) and the Tian Shan (Kyrgyzstan). The northern boundary vaguely corresponds to the beginning of the Taiga. More recently, evidence for the presence of the culture in Xinjiang in far-western China has also been found. In the Volga basin, interaction with the Srubna culture was the most intense and prolonged, and Federovo style pottery is found as far west as Volgograd. Mallory notes that the Tazabagyab culture south of Andronovo could be an offshoot of the former (or Srubna), alternatively the result of an amalgamation of steppe cultures and the Central Asian oasis cultures (Bishkent culture and Vaksh culture). In the initial Sintastha-Petrovka phase, the Andronovo culture is limited to the northern and western steppes in the southern Urals-Kazakhstan. Towards the middle of the 2nd millennium in the Alakul Phase (2100–1400 BC), the Fedorovo Phase (1400–1200 BC) and the final Alekseyevka Phase (1400–1000 BC), the Andronovo cultures begin to move intensively eastwards, expanding as far east as the Upper Yenisei in the Altai Mountains, succeeding the non-Indo-European Okunev culture. In southern Siberia and Kazakhstan, the Andronovo culture was succeeded by the Karasuk culture (1500–800 BC). On its western border, it is roughly contemporaneous with the Srubna culture, which partly derives from the Abashevo culture. The earliest historical peoples associated with the area are the Cimmerians and Saka/Scythians, appearing in Assyrian records after the decline of the Alekseyevka culture, migrating into Ukraine from ca. the 9th century BC (see also Ukrainian stone stela), and across the Caucasus into Anatolia and Assyria in the late 8th century BC, and possibly also west into Europe as the Thracians (see Thraco-Cimmerian), and the Sigynnae, located by Herodotus beyond the Danube, north of the Thracians, and by Strabo near the Caspian Sea. Both Herodotus and Strabo identify them as Iranian. The Andronovo culture consisted of both communities that were largely mobile as well as those settled in small villages. Settlements are especially pronounced in its Central Asian parts. Fortifications include ditches, earthen banks as well as timber palisades, of which an estimated twenty have been discovered. Andronovo villages typically contain around two to twenty houses, but settlements containing as much as a hundred houses have been discovered. Andronovo houses were generally constructed from pine, cedar, or birch, and were usually aligned overlooking the banks of rivers. Larger homes range in the size from 80 to 300 sqm, and probably belonged to extended families, a typical feature among early Indo-Iranians. Andronovo livestock included cattle, horses, sheep, goats and camels. The domestic pig is notably absent, which is typical of a mobile economy. The percentage of cattle among Andronovo remains are significantly higher than among their western Srubna neighbours. The horse was represented on Andronovo sites and was used for both riding and traction. Agriculture also played an important role in the Andronovo economy. The Andronovo culture is notable for regional advances in metallurgy. They mined deposits of copper ore in the Altai Mountains from around the 14th century BC. Bronze objects were numerous, and workshops existed for working copper. The Andronovo dead were buried in timber or stone chambers under both round and rectangular kurgans (tumuli). Burials were accompanied by livestock, wheeled vehicles, cheek-pieces for horses, and weapons, ceramics and ornaments. Among the most notable remains are the burials of chariots, dating from around 2000 BC and possibly earlier. The chariots are found with paired horse-teams, and the ritual burial of the horse in a "head and hooves" cult has also been found. Some Andronovo dead were buried in pairs, of adults or adult and child. At Kytmanovo in Russia between Mongolia and Kazakhstan, dated 1746–1626 BC, a strain of Yersinia pestis was extracted from a dead woman's tooth in a grave common to her and to two children. This strain's genes express flagellin, which triggers the human immune response. However, by contrast with other prehistoric Yersinia pestis bacteria, the strain does so weakly; later, historic plague does not express flagellin at all, accounting for its virulence. The Kytmanovo strain was therefore under selection toward becoming a plague (although it was not the plague). The three people in that grave all died at the same time, and the researcher believes that this para-plague is what killed them. Soma may have originated in the Andronovo-culture. A large group of scholars associate the Andronovo culture with the Indo-Iranians; it was furthermore credited with the invention of the spoke-wheeled chariot around 2000 BC. 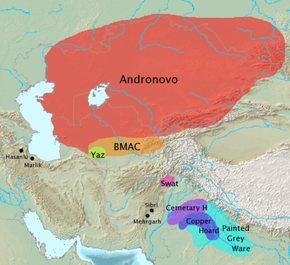 The association between the Andronovo culture and the Indo-Iranians is corroborated by the distribution of Iranian place-names across the Andronovo horizon and by the historical evidence of dominance by various Iranian peoples, including Saka (Scythians), Sarmatians and Alans, throughout the Andronovo horizon during the 1st millennium BC. Sintashta on the upper Ural River, noted for its chariot burials and kurgans containing horse burials, is considered the type site of the Sintashta culture, forming one of the earliest parts of the "Andronovo horizon". It is conjectured that the language spoken was still in the Proto-Indo-Iranian stage. Comparisons between the archaeological evidence of the Andronovo and textual evidence of Indo-Iranians (i. e. the Vedas and the Avesta) are frequently made to support the Indo-Iranian identity of the Andronovo. The modern explanations for the Indo-Iranianization of Greater Iran and the Indian subcontinent rely heavily on the supposition that the Andronovo expanded southwards into Central Asia or at least achieved linguistic dominance across the Bronze Age urban centres of the region, such as the Bactria–Margiana Archaeological Complex. While the earliest phases of the Andronovo culture are regarded as co-ordinate with the late period of Indo-Iranian linguistic unity, it is likely that in the later period they constituted a branch of the Iranians. The identification of Andronovo as Indo-Iranian has been challenged by scholars who point to the absence of the characteristic timber graves of the steppe south of the Oxus River. Sarianidi states that "direct archaeological data from Bactria and Margiana show without any shade of doubt that Andronovo tribes penetrated to a minimum extent into Bactria and Margianian oases". Eugene Helimski has suggested that the Andronovo people spoke a separate branch of the Indo-Iranian group of languages. He claims that borrowings in the Finno-Ugric languages support this view. Vladimir Napolskikh has proposed that borrowings in Finno-Ugric indicate that the language was specifically of the Indo-Aryan type. Since older forms of Indo-Iranian words have been taken over in Uralic and Proto-Yeniseian, occupation by some other languages (also lost ones) cannot be ruled out altogether, at least for part of the Andronovo area, i. e., Uralic and Yeniseian. The Andronovo have been described by archaeologists as exhibiting pronounced Caucasoid features. A 2004 study also established that, during the Bronze and Iron Age period, the majority of the population of Kazakhstan (part of the Andronovo culture during Bronze Age) was of West Eurasian origin (with mtDNA haplogroups such as U, H, HV, T, I and W), and that prior to the thirteenth to seventh century BC, all Kazakh samples belonged to European lineages. Other studies confirm that during Bronze Age in areas to the north of present-day China, the boundary between Caucasoid and Mongoloid populations was on the eastern slopes of the Altai, in Western Mongolia. Some Caucasoid influence extended also into Northeast Mongolia, and the population of present-day Kazakhstan was Caucasoid during the Bronze and Iron Age period. 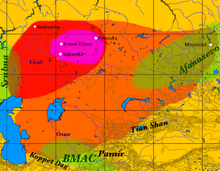 Archaeological investigations likewise suggest that in the steppe region of Central Asia and the Altai Mountains, the first food production began towards the end of the third millennium BC and that the peoples who first entered this region were Caucasoid of the Afanasevo culture who came from the Aral Sea area (Kelteminar culture). In 2009, a genetic study of ancient Siberian cultures, the Andronovo culture, the Karasuk culture, the Tagar culture and the Tashtyk culture, was published in Human Genetics. Ten individuals of the Andronovo horizon in southern Siberia from 1400 BC to 1000 BC were surveyed. Extractions of mtDNA from nine individuals were determined to represent two samples of haplogroup U4 and single samples of Z1, T1, U2e, T4, H, K2b and U5a1. Extractions of Y-DNA from one individual was determined to belong to Y-DNA haplogroup C (but not C3), while the other two extractions were determined to belong to haplogroup R1a1a, which is thought to mark the eastward migration of the early Indo-Europeans. Of the individuals surveyed, only two (or 22%) were determined to be Mongoloid, while seven (or 78%) were determined to be Caucasoid, with the majority being light skinned with predominantly light-eyes and light-hair. In June 2015, another genetic study surveyed one additional male and three female individuals of Andronovo culture. Extraction of Y-DNA from this individual was determined to belong to R1a1a1b2a2 (Z93, clade Z2121). Extractions of mtDNA were determined to represent two samples of U4 and two samples of U2e. A 2018 study by Narasimhan et al examined genetic data from several individuals belonging to the Andronovo culture. They were found to be genetically related to earlier Bronze Age populations of the Pontic-Caspian steppe (called Steppe_EMBA for Early-Middle Bronze Age, by the authors). In addition, they harbored ancestry from European Middle Neolithic farmer populations. Narasimhan et al used the label Steppe_MLBA (Middle-Late Bronze Age) for this relatively homogeneous population spread across a vast region of Eastern Europe and Central Asia during 2000 - 1400 BCE. Most male individuals examined belonged to the Y chromosome haplogroup R1a-Z645, especially the Z93 subclade. ^ Allentoft, Morten; Sikora, Martin (2015). "Population genomics of Bronze Age Eurasia". Nature. 522 (7555): 167–172. doi:10.1038/nature14507. ^ a b Dupuy, Paula Doumani; Jia, Xiaobing; Cong, Dexin; Betts, Alison; Jia, Peter W. (2017). "Adunqiaolu: new evidence for the Andronovo in Xinjiang, China". Antiquity. 91 (357): 621–639. doi:10.15184/aqy.2017.67. ISSN 1745-1744. ^ a b "Central Asian Arts: Neolithic and Metal Age cultures". Encyclopædia Britannica Online. Encyclopædia Britannica. Retrieved March 2, 2015. ^ Simon Rasmussen et al. (2015). "Early Divergent Strains of Yersinia pestis in Eurasia 5,000 Years Ago". Cell. 163 (3): 571–582. doi:10.1016/j.cell.2015.10.009. PMC 4644222. PMID 26496604. CS1 maint: Uses authors parameter (link), S14-15. This sample is marked "RISE505". ^ Rasmussen, 578: the phylogenetic tree has RISE505 split off before the common ancestor of historic plague. ^ a b c Keyser, Christine; Bouakaze, Caroline; Crubézy, Eric; Nikolaev, Valery G.; Montagnon, Daniel; Reis, Tatiana; Ludes, Bertrand (May 16, 2009). "Ancient DNA provides new insights into the history of south Siberian Kurgan people". Human Genetics. 126 (3): 395–410. doi:10.1007/s00439-009-0683-0. PMID 19449030. ^ Koryakova, L. (1998). "An Overview of the Andronovo Culture: Late Bronze Age Indo-Iranians in Central Asia". The Center for the Study of the Eurasian Nomads (CSEN). Retrieved 16 September 2010. ^ Mallory 1989: "The settlement and cemetery of Sintashta, for example, though located far to the north on the Trans-Ural steppe, provides the type of Indo-Iranian archaeological evidence that would more than delight an archaeologist seeking their remains in Iran or India." ^ Helimski, Eugene. The southern neighbours of Finno-Ugrians: Iranians or an extinct branch of Aryans („Andronovo Aryans")? In: Finnisch-ugrische Sprachen in Kontakt. Maastricht 1997, pp. 117–125. ^ Напольских В. В. Уральско-арийские взаимоотношения: история исследований, новые решения и проблемы. Индоевропейская история в свете новых исследований. М.: МГОУ, 2010. С. 229—242. ^ Witzel, M. Linguistic Evidence for Cultural Exchange in Prehistoric Western Central Asia. 2003, Sino-Platonic Papers 129 (PDF). ^ Fox, Lalueza; Sampietro, M. L.; Gilbert, M. T. P.; Facchini, F.; Pettener, D.; Bertranpetit, J. (May 7, 2004). "Unravelling migrations in the steppe: mitochondrial DNA sequences from ancient central Asians". Proceedings of the Royal Society. 271 (1542): 941–7. doi:10.1098/rspb.2004.2698. PMC 1691686. PMID 15255049. ^ González-Ruiz, Mercedes; et al. (2012). "Tracing the Origin of the East-West Population Admixture in the Altai Region (Central Asia)". PLOS ONE. 7 (11): e48904. doi:10.1371/journal.pone.0048904. PMC 3494716. PMID 23152818. ^ Hollard, Clémence; et al. (2014). "Strong genetic admixture in the Altai at the Middle Bronze Age revealed by uniparental and ancestry informative markers". FSI:Genetics. 12: 199–207. doi:10.1016/j.fsigen.2014.05.012. PMID 25016250. ^ Kim, Kijeong; et al. (2010). "A western Eurasian male is found in 2000-year-old elite Xiongnu cemetery in Northeast Mongolia". American Journal of Physical Anthropology. 142 (3): 429–40. doi:10.1002/ajpa.21242. PMID 20091844. ^ Ismagulov, O; et al. (2010). "Physical Anthropology of Kazakh People and their Genesis". ^ Panyushkina, Irina P; et al. (2013). Liviu Giosan; Dorian Q. Fuller; Kathleen Nicoll; Rowan K. Flad; Peter D. Clift (eds.). Climate-Induced Changes in Population Dynamics of Siberian Scythians (700–250 BC). ResearchGate. Geophysical Monograph Series. pp. 145–154. doi:10.1029/2012GM001220. ISBN 9781118704325. ^ Allentoft, Morten E.; Sikora, Martin; et al. (2015). "Population genomics of Bronze Age Eurasia". Nature. 522 (7555): 167–172. doi:10.1038/nature14507. ^ Sample RISE512 (Allensoft et al 2015). ^ Reich, David; Pinhasi, Ron; Frachetti, Michael; Kennett, Douglas; Thangaraj, Kumarasmy; Boivin, Nicole; Anthony, David; Meyer, Matthias; Lalueza-Fox, Carles (2018-03-31). "The Genomic Formation of South and Central Asia". bioRxiv: 10. doi:10.1101/292581. Anthony, David; Vinogradov, Nikolai (1995), "Birth of the Chariot", Archaeology, 48 (2), pp. 36–41 . Beckwith, Christopher I. (16 March 2009). Empires of the Silk Road: A History of Central Eurasia from the Bronze Age to the Present. Princeton University Press. ISBN 978-0691135892. Retrieved 30 May 2015. Bryant, Edwin (2001), The Quest for the Origins of Vedic Culture: The Indo-Aryan Migration Debate, Oxford University Press, ISBN 978-0-19-513777-4 . Diakonoff, Igor M. (1995), "Two Recent Studies of Indo-Iranian Origins", Journal of the American Oriental Society, American Oriental Society, 115 (3), pp. 473–477, doi:10.2307/606224, JSTOR 606224 . Mallory, J. P. (1989). In Search of the Indo-Europeans: Language, Archaeology, and Myth. Thames and Hudson. ISBN 978-0500050521. Retrieved February 14, 2015. Mallory, J. P. (1997). Encyclopedia of Indo-European Culture. Taylor & Francis. ISBN 978-1884964985. Retrieved February 15, 2015. Mallory, J. P.; Mair, Victor H. (2000). The Tarim Mummies: Ancient China and the Mystery of the Earliest Peoples from the West. London: Thames & Hudson. ISBN 978-0-500-05101-6.